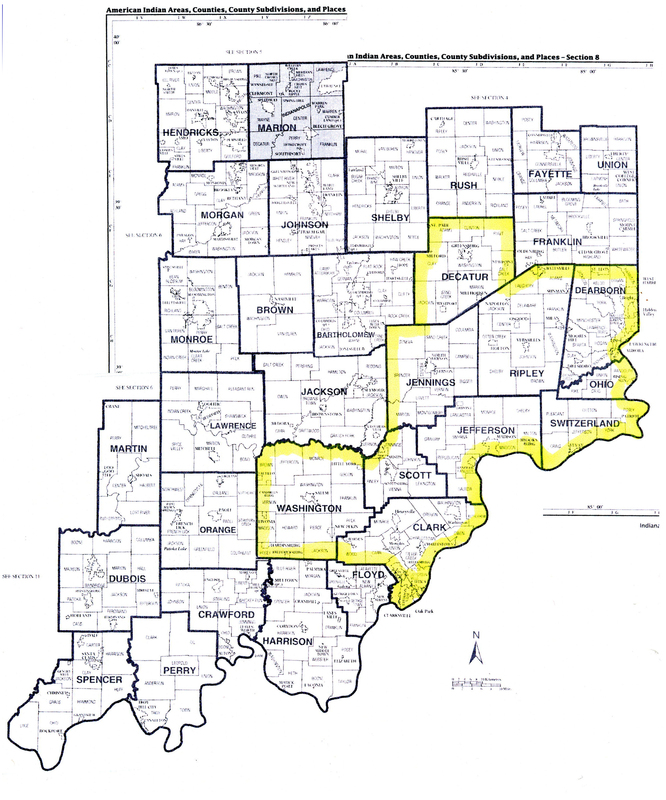 OHC protects land in Jefferson, Jennings, Switzerland, Ohio, Dearborn, Ripley, Washington, Clark, Scott, and Decatur Counties. What is a land trust, exactly? Learn what we do. What is unique about the 10 southeastern counties that we call home? Five counties—Clark, Jefferson, Switzerland, Ohio and Dearborn—have as their boundary the Ohio River, with its accompanying cliffs and waterfalls. This section of Indiana is underlain by limestone bedrock which surfaces near the Ohio River, but is covered by glacial deposits and windblown loess at a depth of several feet north of the River. The oldest sedimentary rock in Indiana is exposed at the base of Clifty Falls Canyon. Clark and Scott counties include a part of the Knobstone Escarpment and the Scottsburg Lowland, which creates an impressive topographic contrast. Learn more about this area by reading about Hiker’s Knob and Wheeler Hollow, two properties we’ve helped conserve along the Knobstone Escarpment. Much of the central part of OHC’s area, including Jennings County, is very flat and poorly drained. The forests here are fragmented by farmland, but where they remain white oaks, hickories, and gums thrive on the wet soils. These “Flatwoods” communities are flooded in spring and droughty in summer. Tipped trees leave behind holes that fill each spring making create vernal pools. These pools are perfect for frogs and salamanders to deposit their eggs because there are no fish to feed on the developing young. Guthrie Woods and Tribbetts Woods are excellent examples of flatwoods communitys. Southeast Indiana is a special place. OHC is working hard to protect its natural heritage. We hope you will join us in this important work.